Spice up your menu with our new take on loaded nachos made with Campbells® Cream of Chicken Condensed Soup, melted cheese and crumbled spicy sausage, topped with tomatoes and green onions. This delicious starter is perfect for any menu! chipotle peppers in adobo sauce	 1 oz. 2 tbsp. 1. In a large skillet, heat oil over medium-high heat. Add onion. Sauté for 10 minutes, or until golden and caramelized. 2. Stir in garlic, chipotle with adobo and cumin. Cook 2-3 minutes. 2. 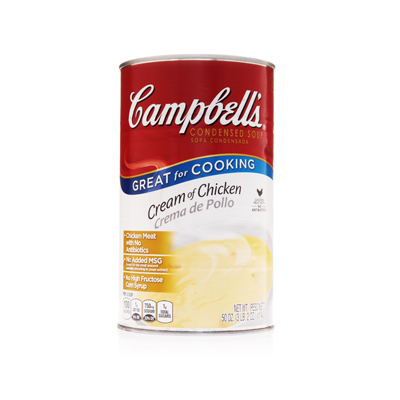 Mix in Campbells® Cream of Chicken Soup and water. Bring to a simmer. return to a simmer. 3. Mix in chorizo. Return to a simmer. 4. Stir in cheese and cilantro. Heat through. Reserve. diced tomatoes, chopped	 15 oz. 36 tbsp. green onion, thinly sliced	 5 oz. 18 tbsp. 5. 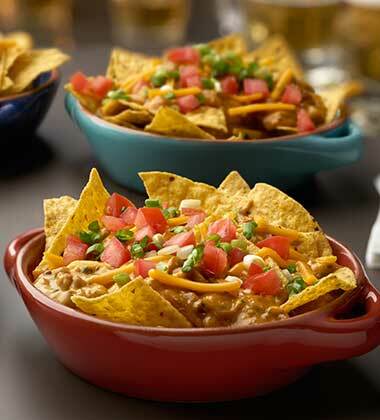 To Assemble Each Serving, Portion the following into individual casserole dishes and bake at 350°F. for 5 minutes or until cheese begins to melt. chipotle peppers in adobo sauce	 1.25 oz. 2 tbsp. diced tomatoes	 14.5 oz. 36 tbsp. green onion	 4.5 oz. 18 tbsp. Use other dippers such as crispy fried vegetables or crisp croutons. Fried chicken nuggets could also be used with the Fundido. Prepared salsa could also be stirred into the Fundido base for a flavor variation.